It's extra wide Very reliable. Very sturdy. "OK, We found this stroller and felt we hit the Jackpot. Believe me, this is our 3rd. stroller, and it is the Cadillac of them all. It is everything we needed. It is extra wide, which we needed. It has plenty of pockets in it for those extra things, like cell phone, coupons etc. It has a place for your drink. It is very sturdy and solid. Easy to fold and unfold. it folds up flat. The bottom storage container is very large and holds a lot. Our dogs love it because they can lay down, or stand up, and look out the mesh to see the people. One of the things I know they like about the stroller is, THEY FEEL SAFE IN IT. We take them out to eat with us all the time. They love being with us. . The stroller weighs 20 lbs flat. 18&quot; x 30&quot; fully expanded. It’s not like the other strollers that have a zipper for the closure. This one you let the top down and it has 2 tabs you close if you choose too, we only close 1. Other wise like the dogs in the pictures they like to visit the people going by, as they are very social. (For your information, our dogs weigh 10 lbs. 8 oz, the other one is 9 lbs. 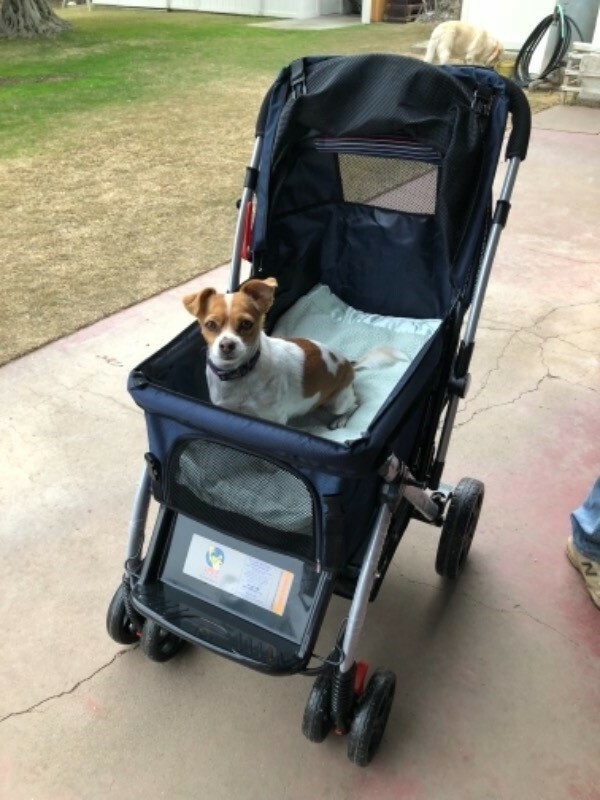 We are so Grateful to HPZ for thinking of all the needs of a pet stroller and covered them all in the construction of this one. Well worth the money. Thank You." "This is a fantastic stroller. It is a little heavier than I expected and the instructions could have been a little more detailed. Any inconveniences are greatly outweighed by features. My 32 lb arthritic Beagle can ride stretched out or she can sit up and my Shih Tzu can join her and still have room to move about.The ride is very smooth. Well thought out product. It is a Ferrari of a stroller. Highly recommend." 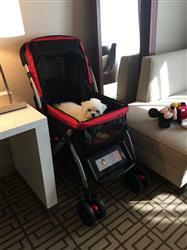 This is a MUST have for your pet..
"I loved this stroller so much that I purchased first a red one and now this navy one. Smooth ride and super easy to open and close. Downside is that if you are going to travel in an airplane you will have to check it in with your luggage because it won’t fit through the TSA machine. So make sure you also get an xlarge stroller bag for it to keep it from getting dirty." Roomy, sturdy, easy to maneuver. "The width...both dogs can look &quot;out front&quot; at the same time, its also a smooth ride. My 7yr old grandson came over to help me get it out of the box, open it up and put the wheels on. He said that he knows all about strollers! He did! Its that easy, and away we went for a walk...he did all the pushing. Very sturdy &amp; easy to maneuver." "This pet rover was easy to put together, it's easy to pack in the car and my dog loves to go for rides. 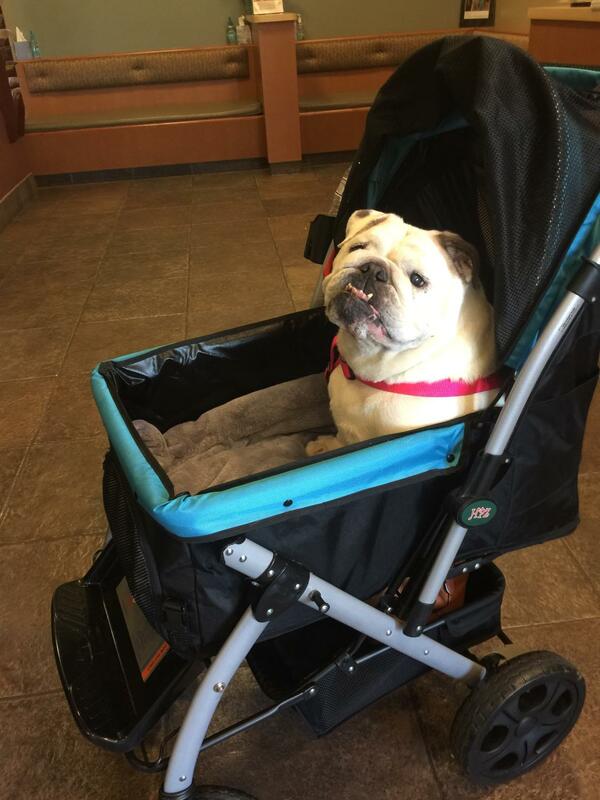 She's a 60 pound bulldog with issues walking, and the rover fits her great. I would buy again and again. Love this pet rover. " "Very well made and well thought out cart. 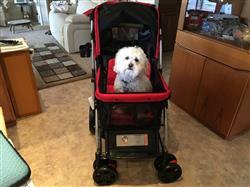 Definitely one of the best pet strollers out there! Highly recommend it!" "Our furbaby, Courtney is in love with this! It's easy to use and she is comfortable!" "We have a big cat that has to be transported through a couple of long halls where pets are not allowed to walk. He is 13 pounds and too heavy for us to want to carry. Now, he has his own &quot;Cadillac&quot; and travels in style. The carriage is quite sturdy. It is a bit heavy to lift into the car, but that might be because we are weak. ;-)"
"What a luxuriously comfortable pet stroller for walking several miles each day. Even my grumpy kitty loves it!" 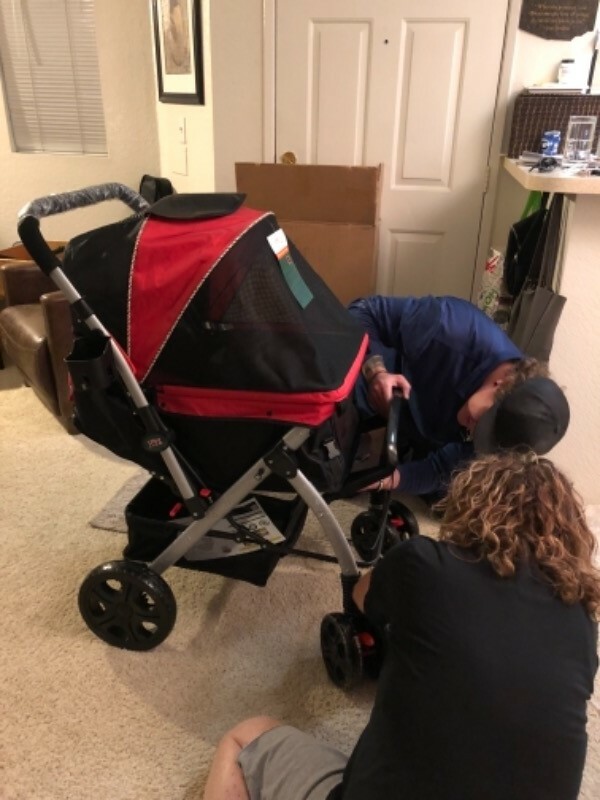 "Previously I wasted over $150 on a stroller that wasn't easy to assemble. All vendors say 'easy to assemble.' Baloney! I'm a senior and at the time no one was available to help me assemble this Pet Rover. First, I panicked. Second, I finally arranged for a friend to stop by and help. Third, I thought I'd see if I could indeed do this by myself. Well, two minutes later, I had attached the wheels. I couldn't believe it. My two Shinpoo's each weigh about 15 pounds. They fit perfectly, with room to spare. I reside in downtown Chicago and use this to transport my 'kids' to the groomer and Vet. This stroller rides as smooth as if it were on glass. Travelled over broken sidewalks, high curbs and gravel like surfaces. It still rode smooth and it turned on a dime (if you wanted it to). I couldn't be more pleased. This is my best purchase ever. By the way, the red is fabulous." Strong, Easy to assemble, large enough for my 30 pound Pooch with room to spare. 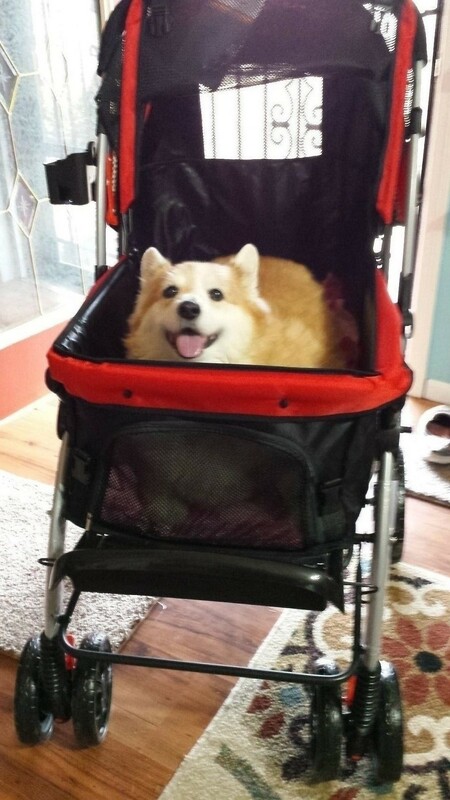 "This is the perfect dog carriage for my 30 pound Llasa Poo. I tried three other carriages. One lacked headroom for sitting up with the lid closed. This one is roomy and perfect. He can lie down without scrunching and it is wide enough for him to turn around. The floor is firm for his weight (unlike the three wheeled stroller). It was super easy to put together. Just snap on the amply-sized wheels. The fact that the handle reverses is a huge plus. I’m very happy with this stroller." "This is a very sturdy stroller ! Good for a lot of roaming around ! Plenty of air vents and the hood is great! Customer Service is tops.I told them my problem ( zipper had been installed improperly) and no questions asked .I had a new stroller in just 3 days or so.My only regret was that I didn't buy a smaller ,lighter weight stroller.I have had several back surgeries and also both shoulders. Now at my age it is difficult to lift the stroller. It is a great heavy duty stroller and really light for what it is made for....I just wasn't thinking ahead and considering my limitations. So I will probably need to buy another stroller after all...and I will certainly buy from these wonderful people !" "We love our Pet Rover Stroller! My husband uses it to take our Tibetan Terrier, Paris, to visit nursing homes with Furry Friends. The stroller is very strong and sturdy and it is high enough to push up next to a bed so people can pet our dog. Paris feels safe and secure. She is a medium size dog (40 lbs). Customer Service is fast, helpful, polite, and friendly." 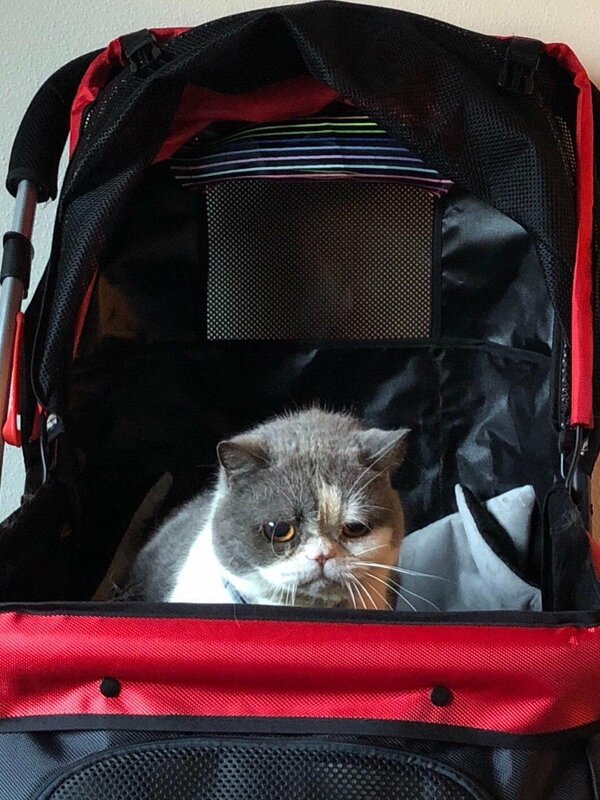 "Matilda loves her new stroller so much. Amazingly the stroller was completely assembled in the box. Just had to pop the wheels on. This is my 7th doggie stroller and I would only buy from here from now. First Class!!!!" "love the stroller, have a shipooh who loves it too, sidewalks bumpy and rides well....customer service has also been wonderful!" "Love the size of this stroller. My 2 shih tzu love the space. People take pics all the time. It was very easy to assemble. Very easy to fold and fits well in our SUV. Had a raw place in the basket. Within 3 days during Christmas weekend they had a new one delivered. Customer service was outstanding." Stroller is good construction. Fur babies will be safe. "Wonderful stroller &amp; excellent material. My 3 small dogs ride together. Love taking them for a stroll"
"I bought the Pet Rover a couple of weeks ago and couldn’t be happier with it! I love the quality of fabric and frame and the large wheels. It is so easy to push, and my dog quickly figured how to get in and out of it! It is nice to have a cup holder attached and additional pockets for disposal bags, phone or snacks! I like the easy-locking cover to snap closed instead of the zipper. It is my favorite new thing! And...ordering with a real person was great and I was able to ask questions. 🤗🐶"
"Our experience has been very positive. 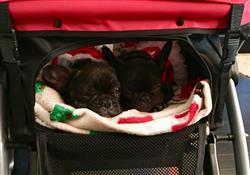 Both our pugs fit in it comfortably, it's easy to fold and we can go places as a family...with one stroller. :) "
"Came as expected. Easy to put together and very nice quality. Nice price point. Can fit my beagle, Pomeranian and shih-poo all together. Handle can be flipped to other side so you can face dogs as well. I’m short so handle bar is a bit high for me. Lightweight stroller which is convenient "
"For the most part I am pretty happy with it. My only negative comment is that it is on the expensive side. My dog loves the spacious area. I would fix the sticker on the foot rest which has a typo! Lol!" "the stroller is great and the shipping was fast"
"I love this double-doggie stroller! Heavy duty but not too bulky for my trunk. 👍🏼"
"From the first stroll they were hooked. Enough room for our two little frenchies 🐶🐶"
"I have 2 Westies Indy and Jimmy both weigh 21 pounds each. Went on a hike with friends. Cookie volunteer to push the stroller with both dogs to incorporate resistant training during the hike. She was amazed on how well the stroller navigate through the different terrain (grass, dirt, sand, uneven side walks and street). She even comment on how light the stroller is for its size. Only issue (minor 1), is the padding in size the carriage. No worries planning to add pillows for the boys. Overall AWESOME stroller. " 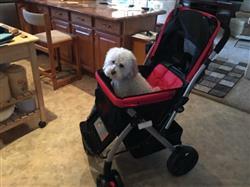 "We love this stroller and so does our dog. It is very roomy and comfortable. Very good quality! I only wish it had a better cup holder. The cup holder moves and sometimes turns my drink upside down and spills over . Other than that it’s a great stroller. " "The stroller was fairly easy to put together. (Only wheels and storage). Very easy to push. Dogs loved it! Seems very sturdy. I'm very excited to be able to walk my dogs in freezing weather. They love being bundled and looking at all the sites and I get my exercise. Great for small or old dogs who can't walk well or very far. A definite A+. " "Love this stroller. It's bigger than a cheap one, but it's better made. The handle is tall enough for my 6'6" husband to easily reach. I love that the handle is reversible. and the customer service is phenomenal, my stroller came with a ripped undercarriage basket and they sent one to me immediately without question. I can't say enough great things about this stroller. " "I bought a lot of different stroller for my dog but this is the best one! 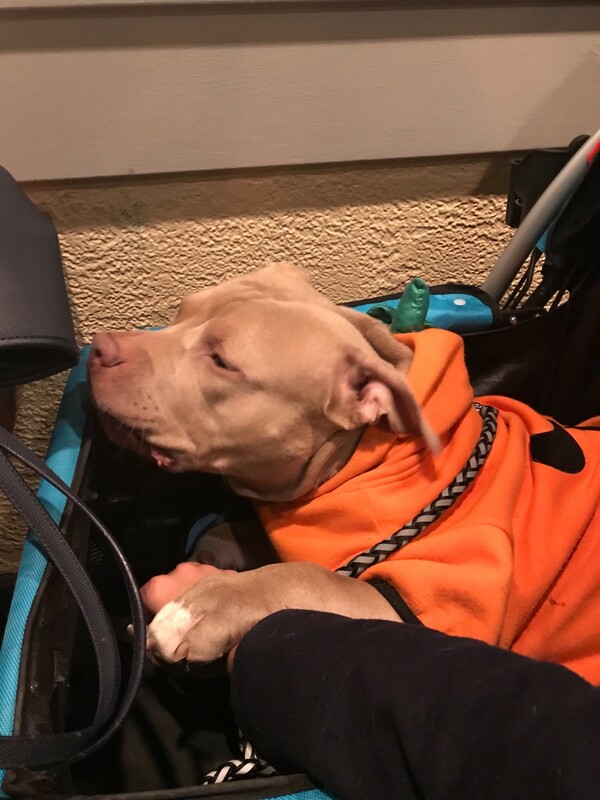 He is huge dog his breed is American Bully and I think he is heaviest dog in the world, everything is good but I have a problem with strollers buttons! They are usually open , I thought its only my problem but when I saw pictures I understand everybody has this problem too, but I hope they use better quality for this because Im ready for buy next stroller from here"